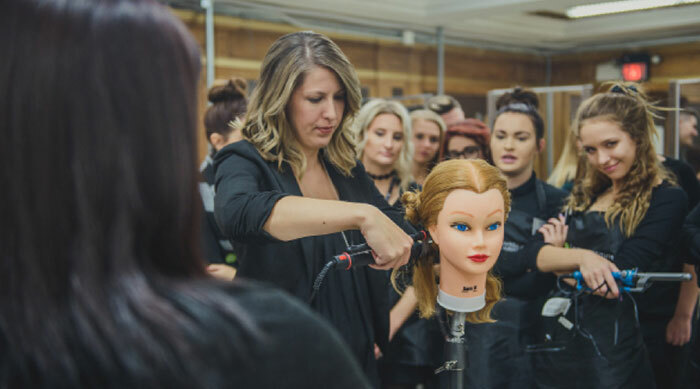 The Post-Secondary Experience: Beauty School or College? The answer is: you don’t have to “miss out” because your dream starts with a different kind of post-secondary education. Choosing beauty school over traditional university or community college doesn’t necessarily mean giving up the “college experience”. The Douglas J Aveda Institute campuses are located just minutes away from neighboring universities. Ann Arbor students can walk to the University of Michigan, East Lansing students will see Michigan State University across the street, our Chicago campus is just minutes away from DePaul University and our Knoxville campus is close by the University of Tennessee. That means you can control your post-secondary experience in a variety of ways, even if you choose beauty school. Finding new friends is one of the best parts of a post-secondary experience. Whether you’ve recently graduated from high school or have given college a try already, you’re probably looking to stick close to your friends. With the close proximity of all of our institutions to college campuses, you’ll have no problem hanging out with your friends, grabbing lunch, studying or even finding a roommate. Another advantage to beauty school is the time spent with like-minded individuals. It’s common to make friends with your fellow aspiring beauty pros while in school. If you’ve not already made BFFs, don’t worry, we have no doubt that you’ll make them at Douglas J Aveda Institute! Speaking of roommates, there is plenty of housing available for students around the university campuses, which means you and your fave friends can find a place to call home together. It also means that you’ll be within walking distance of all of the hottest places to grab a bite or experience the culture of these beautiful cities. Attending fun events is a great way to engage with peers while you’re in school. If you attend a Douglas J. Aveda Institute, football games, parties and study groups will all be close by! You can rally with your friends to cheer on a local team or take advantage of the many parties that are thrown by college students. We know that your studying material will be slightly different from your study group’s, but who doesn’t love to pick up some cappuccinos and gather in the library to harness some brain power? Are all of these reasons fueling your desire to pursue a beauty school education? Contact your closest Douglas J Aveda Institute to get started. Perfect your practical and theoretical knowledge in our 1500-hour cosmetology program. We can teach you skills in haircutting, styling, skin care, nail, care, and makeup artistry! With an education in beauty, there are a variety of exciting careers you could choose from in the future. Get in touch with us today! We can’t wait to help you start your post-secondary education!